Share "Growing, Harvesting and Baling Your Own Hay"
Saving on feed costs, particularly if you raise higher quality hay or split labor with other interested farmers or hobbyists. Controlling exactly how the hay is raised and processed, including chemicals that may be used on the crop. Successfully rotating crops and allowing soil to recover and regenerate with hay crops between other crop seasons. Controlling field overgrowth or encroachment of weeds, forest or other unwanted plants into usable fields and pastures. Making extra money by selling excess hay when the field would otherwise be unused and turn no profit at all. No matter what your reason for growing, harvesting and baling hay, it can be a great project that can reap great rewards. Hay – grasses and legumes that can be dried for stock feed – is simple to grow either as part of a crop rotation or a permanent meadow, and grows naturally in many areas. Better knowledge of the best types of hay and what is needed for a healthy crop, however, will increase the field's yield and nutrition. Local climate, moisture levels and soil condition will all impact hay quality. Alfalfa, clover and fescue grasses are popular hay types, as well as brome and timothy grasses. Oats and millet can also be useful for hay crops. The best hay to raise will depend not only on growing conditions, but also on the livestock that will eventually eat the hay and what their feed preferences may be. When sowing hay, seed should be spread evenly to minimize the intrusion of unwanted weeds or other growth, though most hay types are fast-growing and will quickly crowd out other plants. In drier climates or drought periods, supplemental irrigation may be needed until the hay is well established and thriving. Extra fertilization is not usually needed but can be added, particularly if the field is initially barren or worn out. Hay can be harvested at different times, and it is a balance between harvesting the crop when the yield is highest and the nutrition is richest. Ideally, hay crops should be harvested just when they begin to bloom. When flowers begin to appear, the stalks are at their highest nutritional density, before all that nutrition is channeled into seed formation. Harvesting too early may result in a lower overall yield, while later harvesting means the hay is less nutritious for the stock. The best day for harvesting will be a hot, dry day with low humidity, so cut hay can dry quickly and evenly. Cutting can be done by hand or with different types of machinery, depending on the type of hay crop and the field size. Tools should be kept sharp, and may need to be resharpened several times during the harvest. When harvesting hay, it is best to move slowly and deliberately for even cutting, as well as to minimize harm to any wildlife – snakes, birds, etc. – that may be hiding in the tall grasses. 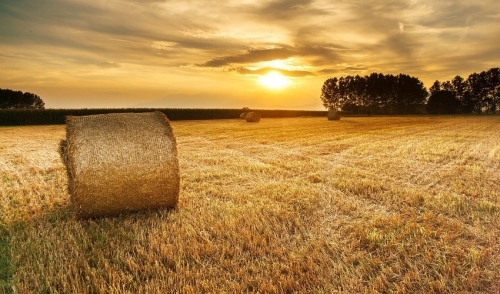 Once the hay is cut, it should be spread evenly to dry thoroughly before baling. Depending on the weather conditions and the weight of the hay, it may be able to dry adequately just on the ground, or it may need to be propped up for better air circulation. Raking or turning the hay can also help it dry evenly. Drying chemicals are available that can be sprayed on cut hay to help it dry more quickly, but this may not be desirable if you prefer more organic, minimally-processed hay. Depending on the soil condition, hay type and when it is sowed and harvested, it may be possible to get two or even three cuttings of hay in one year. Once the hay is cut and dry, it is time for baling. If your harvest is small, it may not be necessary to bale hay at all – it can be stored loose in stacks or in a barn loft. Baling, however, makes the hay more compact for easier transportation or storage, especially if it will be sold. Baling is typically done by machine, and may be done in round or rectangular shapes depending on the type of baling equipment and personal preferences. Bales are tied with twine, wire or nets – twine is cheapest but can also break easiest or decay more quickly, while wire and nets are more durable but costlier. After baling, it is important to store your hay properly or all your work will be wasted. If possible, store bales stacked with some space between them to permit air circulation and heat dissipation, and store them on a pallet so air can also circulate underneath the bales. Bales should be covered from rain and snow, either in a shed or under a sturdy roof or tarp. A good fence around the bales can also keep livestock or wildlife from uninvited snacks. Growing, harvesting and baling hay may not be done by hand very often, but that doesn't mean it can't be or it isn't worthwhile for small farmers or urban hobbyists to take on the challenge. With proper consideration and good effort, any farmer can raise a healthy, nutritious, profitable crop of hay.